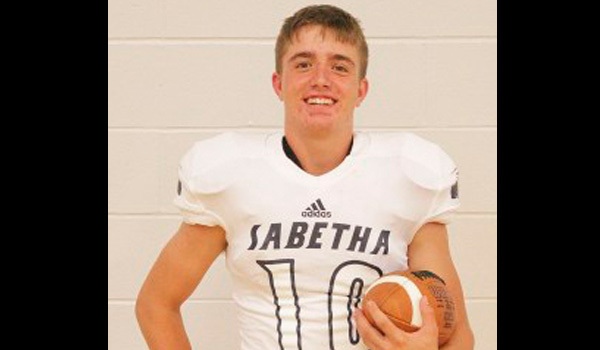 The Rainbow Communications Northeast Kansas Athlete of the Month selected by Sports in Kansas for their play over the month of September is Sabetha High School junior football player Joe Gruber. The junior running back leads a balanched Sabetha rushing attack of multiple players getting carries with 400 rushing yards and four touchdowns over the first five weeks. His biggest performance came last Friday in the 28-21 win over previously undefeated Perry Lecompton in which he rushed for 157 on 24 carries. He also had two rushing touchdowns in each of the Centralia and Holton wins in the first two weeks of the season. Gruber has also been a standout defensively with 22 tackles and a team leading two interceptions, both of which came against Centralia. Sabetha, led by head coach Garrett Michael, is 5-0 and will take on ACCHS this week. Sabetha is far from a one man show with Mitchell Engelken also rushing for 343 yards and three touchdowns.Wyatt Beyer also has 194 rushing yards and three touchdowns. The defense has been the most solid part of the Bluejays as they have seven interceptions as a team and have three fumble recoveries. They have also only allowed a touchdown or less in four of the five games. The much anticipated match-up in districts comes up on October 13th as the Bluejays travel to Seneca to take on the Thunder of Nemaha Central, also 5-0 but will face Perry Lecompton (4-1) this week. Special Thanks to Duane Tramp of Classic Images by Duane for the photo and The Sabetha Herald.